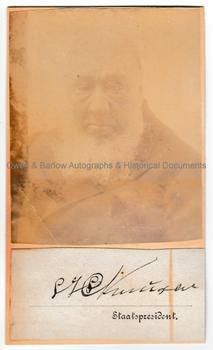 PAUL KRUGER Autograph Signature and Photograph. Stephanus Johannes Paulus Kruger, known as Paul Kruger. South African politician and military leader. President of the South African Republic (or Transvaal) 1893-1900. 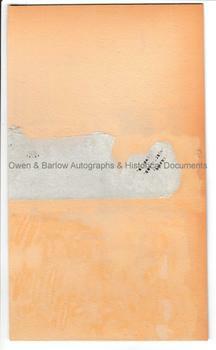 Autograph signature (as President) on paper piece mounted on old pasteboard below a contemporary albumen photograph circa 1895. 18 x 10.5 cms (7 x 4.25 inches). Some browning and offsetting and with mounting traces to verso.